Perhaps the greatest impediment to the church’s work in the world is not discovering what to do but what to stop doing. So much of what happens in the church is programs and methods designed to put something into the disciples. But as we’ve seen in the previous post, we have the fullness of Christ and all His gifts already within us. So, what’s needed instead of a “putting in” is a drawing out of what Jesus has already placed there. Leadership in the New Testament is about equipping the saints to serve the Head, not doing ministry for them...or even to them. We are not to strive to get our teaching into the saints, but to equip them to use the deposit already in them to teach others. This is a radical change in approach for those who lead. Church leadership must shift from trying to put good stuff into Christians and start releasing the God-stuff already within. That is a complete 180º turn for most in church ministry. The deposit is already made and the treasure is within, sealed with a pledge that cannot be broken (2 Tim 1:14; Eph 1:13-14). Christ in you is the hope of glory...and nothing else is (Col 1:27). Our role as leaders is not to try and add anything to it in some egotistic way as if we have anything that deserves to be in the same conversation. Imagine telling people that they have the powerful, continual, presence of the Spirit of Christ within them, and if they just add my teaching or read my book they can be used by God. Sounds awful doesn't it. Because it is. Our role is to help people realize what they already have and walk in that power rather than try and put anything within them. All leadership, speaking, books and methods should be about that. Maturity in Christ is about discovering who you are in Christ, rather than trying to become something that you are not. Equippers have a single role, help people discover what it means to be connected to the Head and to serve Jesus. 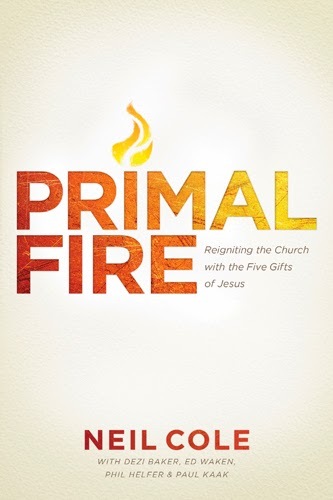 This post is adapted from content in my book Primal Fire.